A cedar fence is a classic look for any home that perfectly frames your home and landscape design. A cedar fence is a classic look for any home that perfectly frames your home and landscape design. While some homeowners prefer cedar fences for the simple look of the wood, others appreciate the way that they age, as even an older cedar fence maintains its great color if it is well maintained over time. If you love your cedar fence, don’t let it fade and fall apart during the year! Follow these three easy steps for maintaining your cedar fence that are sure to keep it looking great in any season. 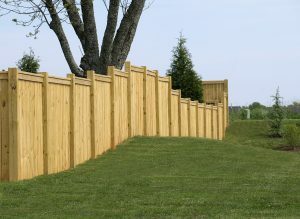 Because the weather of each Maryland season presents its own set of threats to your fence, it is important to take a walk around your fence to look for damage that the elements may have caused. This step is especially important, as catching signs of damage early can spare you costly repairs over time. Particularly after bad storms or inclement weather of any kind, be sure to look for any signs of damage such as cracks, rotting, or loose nails. As you inspect your fence, take note of all damage, big or small, so that you can address them as soon as possible. Cleaning your fence is another important measure in maintaining cedar, as pollen and dirt may damage your fence if left there for too long. With this, it is crucial to wash or rinse your fence between seasons, particularly in spring and fall when pollen levels may be higher. A pressure washer is a great tool for this, and dirt should come off of the fence easily with a lower pressure setting. It is also important that your fence is able to dry completely after being washed to prevent mold growth from deteriorating the cedar. Staining around nails or screws may indicate that the nails must be replaced in a simple repair. Once you have removed the nails and cleaned the surrounding area of the stain, it is especially important to replace them with non-corrosive nails. Damaged boards may also need to be replaced, as signs of rotting or cracking may indicate mold that could spread over time. After replacing these boards, be sure to re-stain the wood so that is is protected in the next season. This will not only keep your fence healthy, but also looking great for summer entertaining all season long. Ready to Update Your Cedar Fence for Summer?